Capitalizing on the ability of our well trained personnel, we have established ourselves as one of the prominent Manufacturer, Exporter & Supplier of Screw Conveyor in the industry. It has been designed as per the established industry standards, using high-grade materials and sophisticated technology. It is commended and cherished because of its exact design made in tune with the latest developments in this industry. 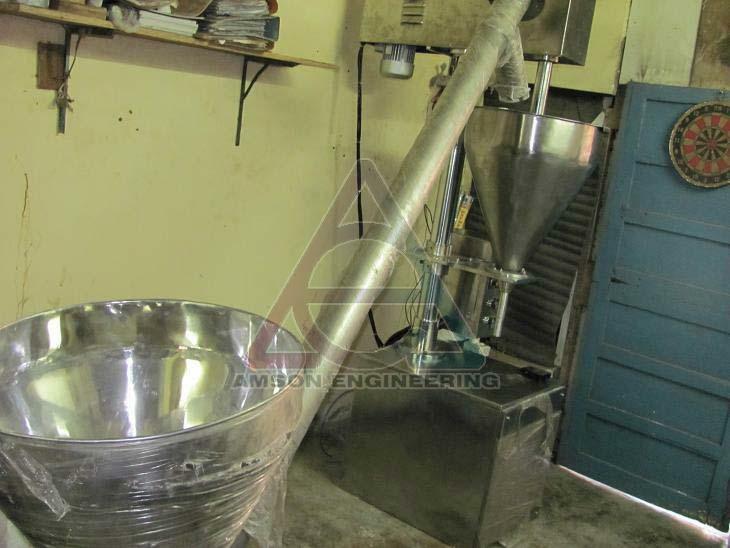 We manufacture Feeders and Screw type Conveyors specially for dusty powders. Some powders are to be feed to a height from ground, and the property of powder is dusty and it requires a closed conveying system to perform these kind of process. Also, some powders required to feed continuously at uniform rate. So, a closed conveying system with controllable speed of flow is preferred. We provide the system known as Screw conveyor/ Screw feeder. This machine can feed all powder fill applications. Screw conveyor can be partially closed with a U section housing or completely closed with a Pipe section housing according to use. Manufacturing material is Stainless Steel 316/304 quality as per client requirement. A specially fabricated Screw is assembled inside a Long barrel with both sides bearing support. One side is connected to a variable speed drive motor and the other is free. Body is having an inlet side and an outlet side at both ends which are diametrically opposite sides. A big hopper can also fitted at inlet side to feed the screw conveyor during working. Normally, a screw conveyor is used to feed powdered material in vertical directions. These conveyors are capable of lifting powder even in 90 degrees. Machine can be independent with self standing frame, or it can be attached to some other units as per required. A variable inclination adjustment bracket can also possible to add in this machine. Machine weight - 180 Kgs approx. Gear box - 40 - 1 Ratio 30 RPM Worm Geared MAX. Feeding limit - 10-15 Kgs/ Minute Max. Output - 25 liters / minute maximum with VFD. All material contact parts, Cover, Base cover, Tray, are in S.S.304 quality Mat finish. Stainless steel 304 Augur ( Screw) type feeding. Screw Pitch 100mm as per feed quantity. Outer diameter of Screw - 96 mm. max. Mild steel Supports for Conveyor - 2 Nos.